D.R. studied the dynamic El Chichón crater lake (Chiapas, Mexico) during his M.Sc. and Ph.D. (2000-2006, UNAM, Mexico). In 2004, D.R. participated to his first CVL workshop at Copahue (CVL6-Argentina) and met with J.C. Varekamp. In 2006, Minoru Kusakabe asked D.R. to give a hand during his yearly Lake Nyos campaign. After his Ph.D. D.R. moved from Mexico to Italy, where he still works at INGV (Bologna). Since 2007 he collaborates with R. Mora-Amador et al. on Poás, Irazú, Turrialba, and, more recently, Rincón de la Vieja. These coincidences gave the idea to J.C. Varekamp to organize the next CVL workshop in Costa Rica, asking D.R. to take the initiative. After the unusual six-year inter-workshop interuption, CVL7-Costa Rica (2010) brought new blood that led to the new CVL Steering Committee. Since 2010, D.R. took the decision to dedicate full-time to lakes. Teaming up with Franco Tassi et al. Italian lakes, besides “latino lakes”, were touched as well, to make D.R.’s approach more limnological. Currently, D.R.’s role is to assure a more multi-disciplinary CVL, linking between, and attract new people and expand into different topics within the community, and beyond. Besides fluid geochemistry, D.R. is interested in probabilistic hazard forecasting and social volcanology, which he tries to diffuse into the lakes. D.R. co-organized CVL7-Costa Rica (2010) with R. Mora-Amador (UCR) and OVSICORI (M. Martínez). He is co-author of the first Monograph on Volcanic Lakes (Springer, 2015), and since 2018 editor of Volcanica. B.W.C. is probably the most active researcher among the crater lake pioneers. His long-term experience, innovating and revolutionary ideas on Ruapehu and White Island, among many other volcanoes, are always illuminating and scientific corner-stones for our community. He is our guide in the acid lake business. Bruce witnessed and monitored the 1995-1996, 2006 and 2007 Ruapehu eruptions, Tongariro’s 2011 eruption and the recent eruption dynamics of White Island, which he started studying together with “the” fluid pioneer Werner F. Giggenbach. B.W.C. is co-author of the first Monograph on Volcanic Lakes (Springer, 2015). B.W.C., together with Agnes Mazot, will organize CVL10-New Zealand in 2019. G.T. is the Cameroonian pioneer on the infamous Lakes Nyos and Monoun. As the first Ph.D. student of Minoru Kusakabe (Misasa University, Japan) G.T. paved the road for the next generation of his Cameroonian colleagues. G.T. was the chief organizer of the CVL9 Workshop (March 2016). As a recognition for serving his country, during CVL9, G.T. received the title of Chevalier de la République du Cameroun, in name of the Cameroonian President, Paul Biya. 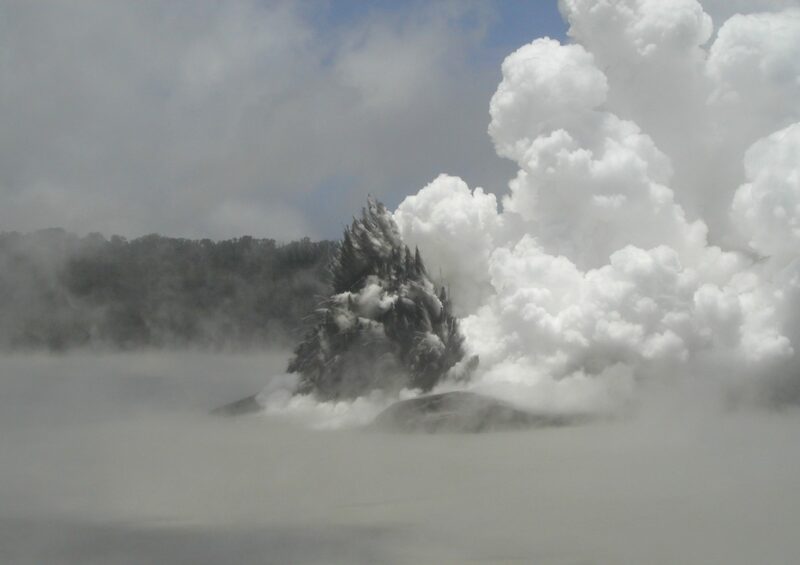 A.M. was the first to make the CO2 accumulation chamber float on active crater lakes. From Indonesia to Italy passing Mexico, since 2008 she makes her chamber float on New Zealand’s volcanic lakes Rotomahana, Ruapehu, etc. A.M., together with B.W.C., will organize CVL10-New Zealand in 2019. T.O. has two decades of crater lake monitoring on his CV (Yugama, Kusatsu-Shirane volcano, Japan), before mentoring Cameroonian and Japanese Ph.D. students as chief of the joint Japan-Cameroon SATREPS project. His relentless dedication to volcanic lakes are stable ground for many among us. T.O. was the chief organizer of the CVL8 Workshop (2013), and, together with C. Caudron and B. Capaccioni, co-editor of the latest volume on volcanic lakes (Geological Society of London). During CVL9, T.O. received the title of Chevalier de la République du Cameroun, in name of the Cameroonian President, Paul Biya. F.T. put many unstudied volcanoes -with or without lakes- on the map with his complete fluid geochemical approach and style. F.T. is the most “limnological” and “wet” among the gas geochemists. Besides being a key CVL SC member, F.T. is the Leader of our “Sister Commission” IAVCEI-CCVG (2013-present). F.T. is tutor of many Italian, Chilean and Argentinan youngsters, creating a steady flux from below of great scientists to assure the future of both CVL and CCVG. F.T. is co-author of the first Monograph on Volcanic Lakes (Springer, 2015), of the Copahue volume, and, together with R. Mora-Amador and O. Vaselli of the Poás volume (in prep.) of the Springer IAVCEI Series Active volcanoes of the world. A.B. is the mentor of packs of crater lake researchers and fluid geochemists since decades (Pierre Delmelle, Agnes Mazot, Corentin Caudron, Loic Peiffer, Robin Campion, Katharine Maussen, among many others). His work on Indonesian crater lakes (Kelut, Kawah Ijen, Papandayan, Dempo,…) then, and Philippine lakes (Pinatubo, Taal) now, is renowned. His research was first dominated by mineraology and geochemistry, but has become more technological throughout the years (satellite, sensors). A.B. is the former CVL Webmaster. R.M.-A. is the guy who best knows Poás’ Laguna Caliente, arguably the most active crater lake on Earth: monthly visits for 20 years now. His current research focusses on physical and historical volcanology of Poás, besides the continuing monitoring efforts of Poás, Irazú, Rincón de la Vieja lake hosting volcanoes, Laguna Hule and Río Cuarto “Nyos-type” lakes, and Costarica’s currently most active volcano Turrialba. R.M.-A. was the chief organizer of the CVL7 Workshop (March 2010) and, together with F.T. and Orlando Vaselli, co-editor of the Poás volume (in prep.) of the Springer IAVCEI Series Active volcanoes of the world. C.C. is CVL’s fresh spearhead for geophysical research, that has made our community broader and more multi-disciplinary in recent years. Revealing secrets from the emblematic Kawah Ijen crater lake (East Java), the largest of the hyper-acidic ones, is his laboratory and master. C.C. might reveal the precursor for phreatic eruptions in the near future… be aware! He organized the unique “Wet Volcanoes” Workshop in September 2014 at Kawah Ijen. C.C. is, together with T. Ohba and B. Capaccioni, co-editor of the latest volume on volcanic lakes (Geological Society of London). J.C. is the face of the “bio-activity lakes”, making CVL not only more “limno”, but also more “bio”. Together with F.T., J.C. tackles the European “Nyos-type” lakes one by one (Albano, Monticchio’s 2, Averno, Pavin, Laacher See, Azores’ many), in search for more than just inorganics. J.C. has some alternative ideas on hosting a Volcanic Lake summer school in Italy. B.B. committed to CVL in 2013, enthusiastically teaching the many fluid geochemists in the CVL community on Lakes. B.B. is a physical limnologists who probed the Japanese maars and caldera lakes. B.B. organizes the spring block course on physical limnology at Heidelberg University. B.B. is a co-chair of the International Society for Limnology (SIL).